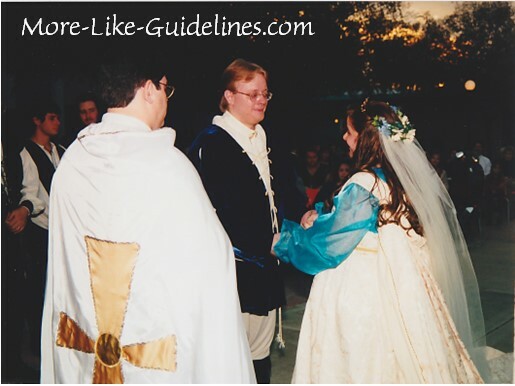 Welcome to the fourth and final post on my Renaissance wedding. Today, I am talking about what the groom, groomsmen, guests and the minister were wearing. Cap’s mom made his tunic from McCalls pattern #2802. 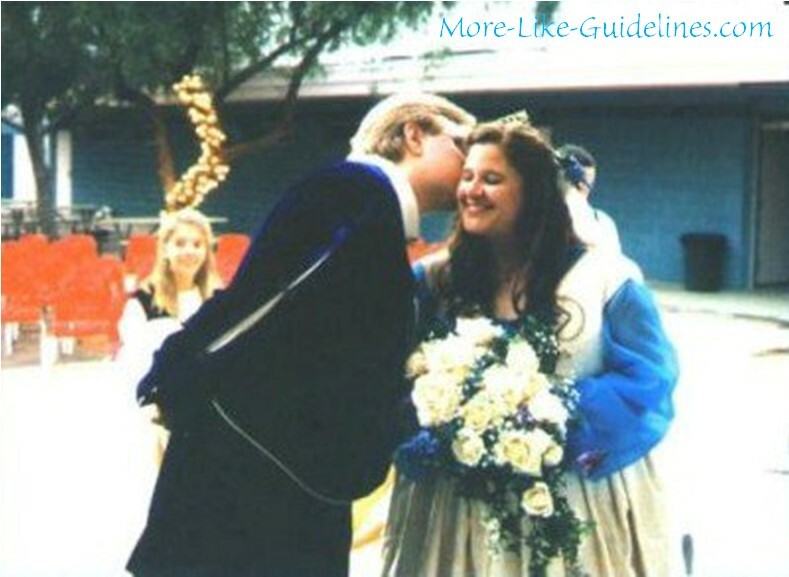 It’s the style shown in blue and white in the picture on the right. Let’s talk about that picture though, kind of ridiculous, right? I mean, what is with that hat? 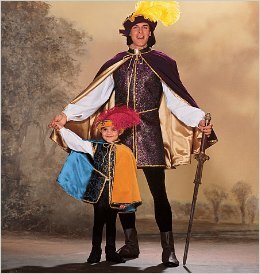 I’ve never seen any Renaissance costume with a hat like that. Obviously, we skipped the hat but we also skipped the jaunty vest that they refer to as a surcoat. Cap’s tunic is was made from blue velvet. If you’ve never worked with velvet, it can be really difficult. When sewing you have to pin the velvet every inch or so because it slides like crazy. It sews pretty well once you have it pinned down, you just want to make sure that it’s all lined up. There’s nothing worse than finishing a long seam only to find that there’s a puckered spot midway through the section. Velvet is really heavy as well, so the seams need to be strong. The tunics the groomsmen wore were also from McCalls #2802, in a black velveteen. Cap’s mom sewed those as well, the shirts were made from white broadcloth from the same pattern. We cheated with the pants and just bought leggings since they would be tucked into the lace up boots. I matched the cording for each groomsmen and bridesmaid pairing, only because I am kind of dorky like that. 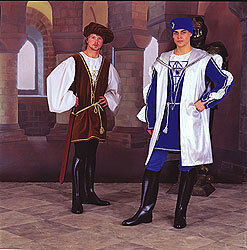 The guys said that the tunic and pants were very comfortable. 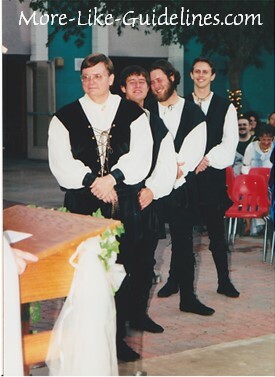 I made my father the same tunic, shirt and pants as the groomsmen. Originally, I wanted to make him something a bit more fun and interesting but since Cap’s father was his best man I didn’t want to do anything offset the balance there. It was a good decision because he looked great with my mom in her black velvet dress. My brother and my nephew used Butterick pattern #5656. They looked great in their tunics and capes. Here is a pic of the flagbearers, my brother’s oldest, my niece and nephew. So happy that they could be there and part of the wedding. We found a great minister, he was a friend of a friend and he was awesome. He was happy to work with us and was quite accomodating with our less than traditional wedding. When we talked about the wedding and what he would wear I offered to make him a costume. He was very pleased. I honestly can’t remember if I made him the cassock type robe underneath or if that was his already. I did so much sewing during those six months and especially in the last month that I just don’t remember. 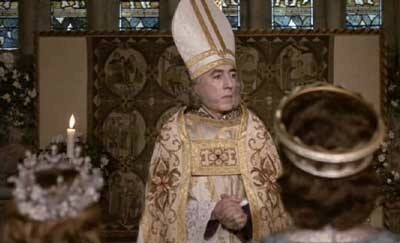 If I did, the robe would have been made out of white muslin and just made to slip over his head. I modeled his robe off the of the bishop’s robe in The Princess Bride. It was much simpler and less ornate but I was really pleased with how it turned out. I used a rectangular piece of fabric, I believe I used party taffeta, mostly because it has a stiffness to it without being very heavy. In the front I added a panel connecting the two edges, I embellished it with gold fabric and trim. I appliqued a large stylized Celtic cross to the back. The back of the robe was long enough to trail behind him a foot or two. There is a picture somewhere of him walking away with his robe flowing out behind him but I’ve looked through our photos about five times trying to find it but it is nowhere to be found. I’ll update this post though it if shows up. 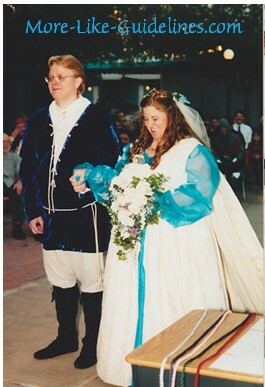 All in all, the wedding was a lot of work but it was so much fun and I love that instead of spending money on renting tuxes and horrid bridesmaid dresses that would never be worn again, I provided a costume that they could wear whenever they wanted. It was definitely worth the work and since I did so much creatively; sewing, bouquets, vows, the wedding really was uniquely mine. I will leave you with my absolute favorite pic from the wedding. We had just signed the marriage certificate and we had a moment to ourselves before pictures started. Next week, I’ll be talking about costumes for kids. Costume Corner will be cross-posted at Cap’s blog, The Geek Registry.